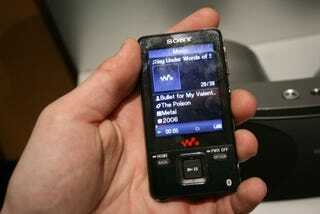 The major difference between the A820 and the A720 Walkmen is Bluetooth (and a 16GB flavor). Unfortunately, the Bluetooth was fairly crappy in the model I fussed with, unless you enjoy the odd rhythm of skipping music. I tried the player in my back jeans pocket, front jeans pocket and front jacket pocket, and got the same in-and-out jolting stream. (Even in line of sight w/ some Bluetooth speakers, range was 10 feet then totally dead.) The bits that made it to the headphones sounded alright though. UI is the same as the last gen of players, though I'm not really a fan of the button layout on this set.